The Gurani are an Iranian ethnic group that consists of a number of sub-groups, including the Bajelani and the Hawrami. The Gurani live in the northern regions of Iran and Iraq in an area commonly known as Kurdistan, or "land of the Kurds." For this reason, they are often categorized as Kurds. It is believed that their original homeland was somewhere near the Caspian Sea. At some point, they were largely assimilated by the expansion of the Kurds; however, their native language, Gorani, remained intact. The Kurds have occupied Kurdistan since as early as 2400 B.C. Many claim to be descendants of the Medes, a nomadic people of the Media Empire, which flourished between 900 and 500 B.C. 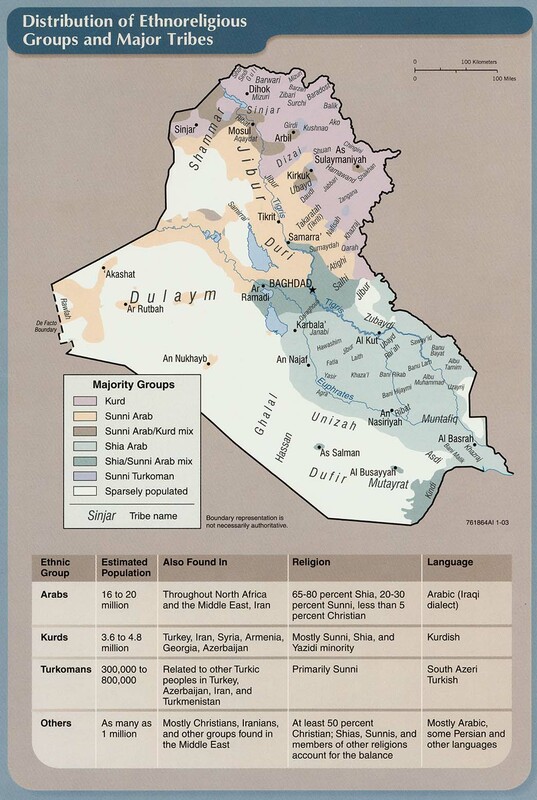 Most of Kurdistan was conquered by Arabs in the seventh century. At that time, its inhabitants converted to Islam. Although the Kurdish population perceives Kurdistan as a nation-state, it is not recognized as a self-governing political entity. The region is primarily mountainous, and the rugged terrain has greatly influenced the lifestyles of those who live there. Although the Gurani are mainly farmers, they have been renowned for their military qualities. In the last century, they provided a standing regiment of between 1,000 and 2,000 men for the Persian army. However, those subjected to Kurdish tribal lordship have completely surrendered their identity. Farming and raising livestock are the chief occupations in Kurdistan. The principal crops are cereals--mainly wheat, barley, rye, and oats. Other crops include cotton, olives, rice, sugar beets, and tobacco. During the summer months, the Gurani, like many other Kurds, take their sheep, goats, donkeys, and mules to higher mountain pastures; winter grazing occurs in the lower plains. The mountainous soils are generally poor, and vegetation is sparse and seasonal. From September 1980 until August 1988, Iran and Iraq were at war. During this eight year period, approximately 1.7 million people were wounded and one million were killed. The underlying cause of the war lay in the long-standing regional rivalry between Persian Iran and Arab Iraq. The immediate cause, however, was a border dispute that began in the mid-1970s. In 1974, Iran had begun supplying weapons to Kurdish nationalists in northern Iraq, enabling them to stage a revolt against the Iraqi government. Saddam Hussein subsequently invaded Iran, believing that victory would be easy. He assumed that Iran's military strength had been greatly weakened by the revolution that had brought the Islamic Republic to power in Iran the previous year. However, he was mistaken. The fierce war ended in August 1988, when Iraq accepted a UN resolution for a cease-fire. In more recent years, the lives of the Kurds and their neighbors of northern Iraq were thrown into chaos by the Persian Gulf War. Iraqi troops drove Kurdish rebels and civilians to the borders of Iran and Turkey, causing a refugee crisis. Thousands fell ill from contaminated water and food in the aftermath of the war. The Gurani are virtually all Muslims. Some belong to the Shi'ite branch of Islam, while others are Sunni (orthodox) Muslims. Shi'ite practices tend toward the ecstatic; however, the Sunnis are staid and simple. The Shi'ites affirm human free will, while the Sunnis are deterministic. The Shi'ites and Sunnis also differ in matters of law and ceremony. However, the fundamental beliefs of both groups are based on the Koran, a book believed to be the revelation of Allah to Mohammed. Affirming that "Allah is the only god and that Mohammed is his prophet," praying five times a day, fasting during the month of Ramadan, giving alms to the poor, and making a pilgrimage to Mecca are the five basic "pillars" of Islam. The cultures of Iran and Iraq have been heavily influenced by the Muslim religion. This is quite evident in the art, literature, and social structures of the two countries. Following the Iran-Iraq War, there were many governmental changes in Iran. In 1979, the Shi'ite clergy led a drive for renewed Islamization. Women were ordered to return to their more traditional roles, movie theaters were closed, and radio stations were prohibited from broadcasting music. The segregation of men and women at social functions was also re-instituted. Many women again wore the traditional chadors, which are loose, usually black, robes. The chador covers a woman's body from head to toe and most of her face. As a result of the Persian Gulf War, Iraq remains in a terrible condition. Basic food and medical items continue to be in short supply. Physically, the needs of the people in this region are great. Their spiritual needs, however, are even greater. The Gurani are without any Christian resources in their own language. Most have not heard a clear presentation of the Gospel. Consequently, there are only a few known Gurani believers in Kurdistan at the present time. Because Islam is the state religion of both Iran and Iraq, it is extremely difficult to minister the Gospel to the Gurani. Prayer is the key to seeing the doors of these nations open to the Gospel of Jesus Christ. * Scripture Prayers for the Bajelani in Iraq. * Pray that missions agencies and churches will accept the challenge of adopting and reaching the Gurani. * Ask the Lord to send forth Christian medical teams and humanitarian aid workers to minister to the needs of the Gurani. * Pray that God will strengthen, encourage, and protect the small number of Gurani believers. * Ask God to raise up prayer teams who will begin breaking up the spiritual soil of Kurdistan through intercession. * Pray for greater freedom to preach the Gospel among the Gurani tribes. * Ask the Lord to save key Gurani leaders who will boldly declare the Gospel to their own people. * Ask the Lord to bring forth many Gurani churches for the glory of His name!